Today was a perfect example of how we have a great range of species available to catch along our local beaches. Our area of the Treasure Coast has a long list of beach accesses with free parking and beautifully maintained areas available for everyone to enjoy. Middle Cove was the spot that I returned to today and the catch list included pompano, whiting, croaker, blue runners, bonefish and a 20-pound permit!! You would be hard pressed to find another area of the state that has such a variety of species to catch in three hours of fishing. The beauty of surf fishing is that everyone can do it. A bag of Fishbites, a couple of rods and some tackle, a beach umbrella, a cooler, and you are in business. The pompano, whiting, and croaker all favored the clam strips today and the bonefish and big permit both hit on the Fishbites. The permit provided a 20-minute battle on a Penn Spinfisher 7500 longcast reel and a 12-foot Penn Prevail rod. I want to thank my friend Ron Robinson from Stuart, who assisted me in landing this fish. Ron is an excellent fisherman in his own right, and he actually went into the surf and grabbed the big permit by the tail and pulled it up onto the beach. You can fight a bigger fish like this on light tackle in the surf (the line test was only 15 pounds) because there aren't any obstructions for the fish to get caught up on. 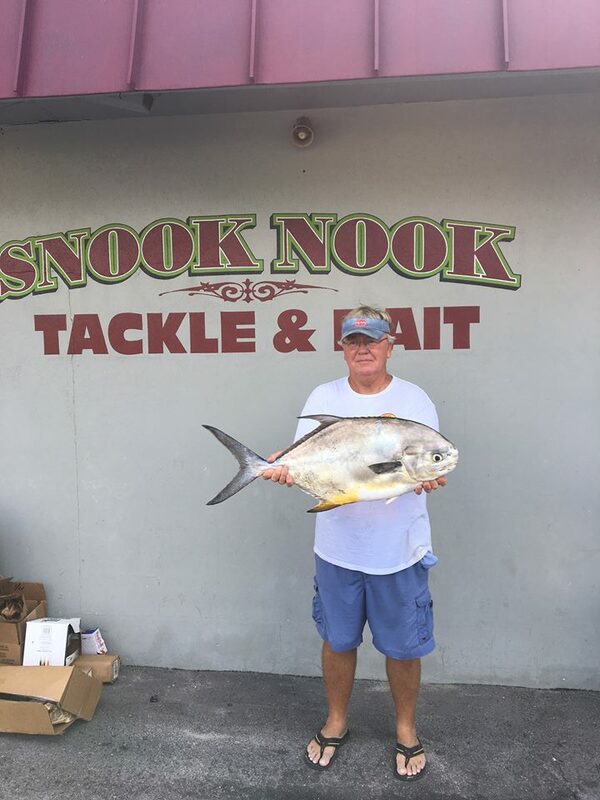 The fact that small hooks can catch big fish was proved today, as the permit hit a pompano rig with a number 1 circle hook. I have always said that Fishbites can catch anything - and today that statement proved more than accurate. The late spring surf fishing continues to roll along for those wanting to bend a rod and have some fun so good luck this weekend and catch em up.